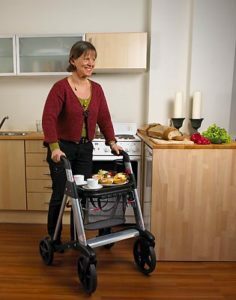 The Active Walker comes with a range of accessories to assist and enhance your rollator. 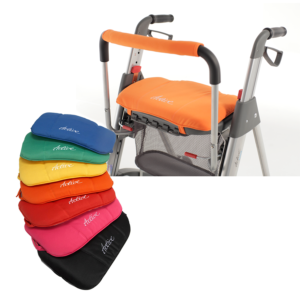 Personalise your Active rollator with these bright and colorful cushion sets. Available in seven different colors – blue, green, yellow, orange, red, pink and black. In addition to being practical and comfy, these cushions really brighten up the look of your rollator. The Active cushion set includes a matching padding for your back rest..
For extra support, this practical, padded backrest moves with the seat to make sure you are always comfortable when sitting down on your rollator. Easy to attach and remove, the tubular aluminium frame is sturdy whilst the padded area keeps you comfortable when you sit down. We believe that you should be able to enjoy the outside in the winter as well which can be a challenge. 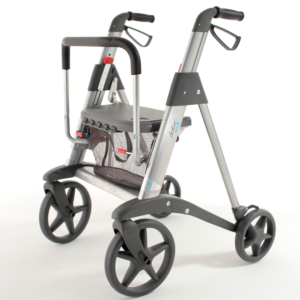 This is why we developed the skis for the Active Walker, to fit the front wheels. The skis float on top of the snow and does not sink into it. They are easy to snap on without any tools. 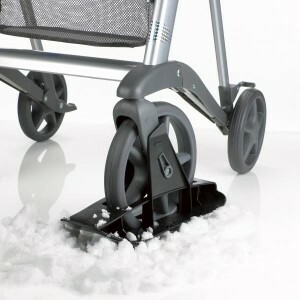 The wheels poke trough a slot in the skis allowing you to roll normally on dry surfaces. The Active deluxe bag attaches easily to the front of the seat, you simply hook it on. 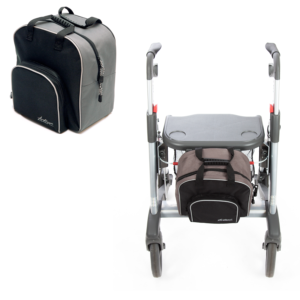 With a practical handle on top, this deluxe bag is perfect for increasing the storage space on your rollator. Attach the cane holder to your rollator to ensure you can bring crutches, canes or even umbrellas with you when you are out and about in the Active Walker. For pairs of crutches you will need to have two cane holders, one attached to each side of your rollator. Convenient serving tray for carrying food and beverages around the house, with two lowered compartments for cups or glasses. Fits easily onto the seat, and can be washed in the dishwasher. If you would like to lock the wheels of your rollator to stop them swivelling and only steer straight ahead, the Active swivel wheel stopper helps you to do just this. It attaches to the front wheels and keeps them straight. 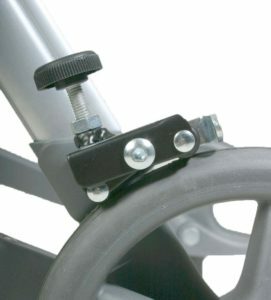 The roll resistor slows the rolling of your Active rollator front wheels and prevents the rollator from rolling freely. 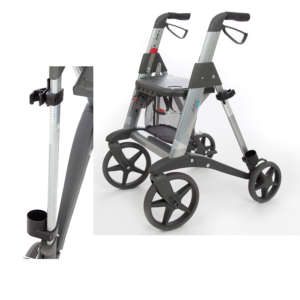 Attaches to the back wheels and can be adjusted to the resistance you require. class="page-template page-template-page-sections page-template-page-sections-php page page-id-282 samba_theme samba_left_nav samba_left_align samba_responsive wpb-js-composer js-comp-ver-4.12 vc_responsive"